Ruchi completed her Masters in Hospital Administration from Tata Institute of Social Sciences and has since been a part of the Medium family. She is a Bachelor in Physiotherapy and has over a year of clinical experience. She has worked across clinical and non- clinical functions in varied hospital set-ups like government, charitable and corporate organizations. 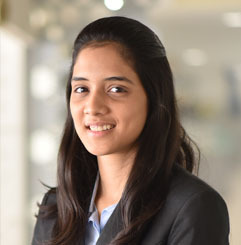 During her MHA program, she interned at a couple of leading hospitals in Mumbai, P. D. Hinduja Hospital and King Edward Memorial Hospital where she worked on various projects in quality, operations, and finance. She also worked with HCG Hospitals, the largest cancer care provider in India, at their Ahmedabad, Vadodara, and Rajkot centers. As an Associate at Medium, she is majorly involved in primary and secondary research, research analysis and execution support.